After 6 years at African Initiatives I am moving on to a new adventure this Friday. Every day this week I will be blogging about my time with the organisation, and my memories of the people, the experiences and our achievements. African Initiatives has been on a journey over the past 6 years, often a turbulent one, as is the way with small organisations with not enough resources or capacity. The one thing for me which has always remained clear is where we want to end up. We have a vision of equality and justice, where everyone can claim and exercise the rights they are entitled to. Some people, when I explain this to them, make a disbelieving “yeah, right, like that’s going to happen” sound. And I have to admit that it is somewhat reminiscent of a Hollywood ending where everyone walks off into a beautiful red-gold sunset when we all know that they trip over a stray rock as soon as they get over the hill. Yet, does it mean that we shouldn’t even aspire to it? One of the stand out stories for me has been a girl we featured in our Christmas Appeal last year, Nebiang eti Paulo. Nebiang lives in northern Tanzania, and is desperate to get an education. Her parents want her to marry as then they will get a dowry for her; as is so often the case with pastoralist girls, particularly in times of dire economic need, marrying your daughter off can be seen as some alleviation to family need. They wouldn’t let Nebiang visit our partner the Pastoral Women’s Council (PWC) when they were in the village interviewing girls for their secondary scholarship scheme. In fact her father went so far as to go to PWC and tell them not to give her one. So one day Nebiang took her future into her own hands and ran away to Embarway School. Picture how hard this would have been for her. Girls in her culture are marginalised. Often they don’t even have somewhere safe to sleep at night because it’s not deemed appropriate for them to sleep under the same roof as their father, which leaves them vulnerable and at risk. They are expected to do the chores, look after siblings; if they are part of a large family including boys their brother’s school fees are paid in preference. It is supposed that a girl when she married will take that education into a new family, so she is not deemed worthy of the (pretty large) financial outlay. Imagine being weighed down with all of this and still having the courage and confidence to fight for your right to an education. When Nebiang got to Embarway she found a teacher and told them what she wanted. The school were in a quandary, they are after all dependent on school fees and can’t set precedents by letting students stay free of charge. Neither could they turn Nebiang away. They contacted the District Education Officer (DEO) and PWC. 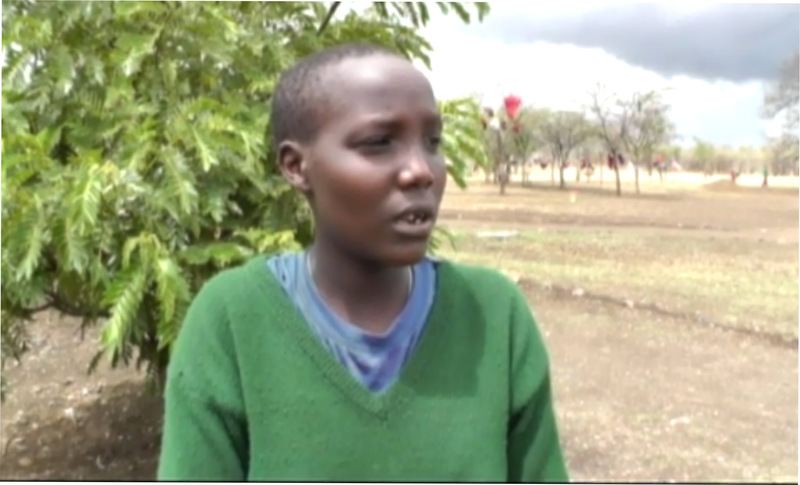 PWC were able to sponsor Nebiang for one year, the DEO helped her to get a trunk and a mattress and one of the teachers at the school paid for her uniform and school books. Nebiang wants to be a teacher. But she is scared. She is scared because she thinks that when she goes back home in the holidays her parents will insist that she is married. She is scared that she will not receive sponsorship for next years school fees and her parents will insist that she is married. But she wants her education, because she believes that it is her right. When at African Initiatives we talk about empowering others to claim their rights it is not a one way street. One thing I will take away from my time here is that in life, people, whether they are in Africa or the UK do not generally sit down and take injustice on the chin. They react against it. They do something about it. What African Initiatives and partners such as PWC do is provide the resources, knowledge and skills that individuals like Nebiang need to fight for their own rights. We work with individuals and communities, educating parents and leaders about the benefits of girl’s education. After all, if you’ve never realised what those benefits could be in the longer term – increased income, better family planning, protection against HIV and AIDS, educated children, healthier families – why would you see girl’s education as important? As we have seen with our programme in Tanzania, once people have that knowledge, change happens. Communities are building places for girls to sleep at night, parents are enrolling their girls in school and girls are standing up with confidence to give voice to their rights and needs. Which makes me think that our vision of an equal world is not pie in the sky. I believe that with support girls like Nebiang will get over the hill in that Hollywood ending, and yes, sometimes they will trip over a rock or two, because after all, that’s life. But they’re not going to fall over and stay there. They will get up again and they will keep on walking. Nebiang has been sponsored to stay in school up until January 2014 thanks to the generosity of our supporters last year. Watch an interview with her here.